Advanced Satellite Products Branch (ASPB) scientists Brad Pierce, Mike Pavolonis, and Justin Sieglaff used aerosol trajectory forecast capabilities from the International version of Infusing Satellite data into Environmental Applications (IDEA-I) to demonstrate how Spinning Enhanced Visible and Infrared Imager (SEVIRI) volcanic ash visible optical depth and ash top pressure retrievals could be used to initialize volcanic ash trajectory predictions. This work was part of activities under the NOAA Volcanic Ash Working Group (VAWG) Science Team and was used to analyze the April 2010 Eyjafjoll eruption in southern Iceland. IDEA-I trajectory initialization software was adapted for SEVIRI ash retrievals and delivered to scientists at the NOAA Air Resources Laboratory (ARL) for use in Operational HYbrid Single-Particle Lagrangian Integrated Trajectory (HYSPLIT) volcanic ash predictions. 24-hour Volcanic Ash trajectory prediction associated with the Eyjafjoll eruption in southern Iceland from IDEA-I valid at 06Z 07 May 2010. The IDEA-I trajectories are colored by their pressure (mb) and were initialized using SEVIRI ash visible optical depth (colored circles) and ash top pressure retrievals provided by Mike Pavolonis (NESDIS/STAR). 500mb wind predictions from the NWS Global Forecasting System (GFS) are shown in white. Chris Velden from CIMSS is coordinating a collaboration among NOAA, NASA and NSF scientists to conduct a major research field project in the Atlantic Ocean basin. The tri-agency hurricane research field program studying tropical cyclone genesis and intensity change begins 15 August 2010. Satellite data and products provided by GOES and other polar orbiters will be key to the forecast and mission support. Along with the routine operational reconnaissance aircraft provided by NOAA and the USAF, three additional piloted aircraft and the unmanned Global Hawk will participate. A ‘dry run’ of the field exercise is being conducted at present, with Velden participating at one of the mock operations centers at NCAR in Boulder, Colorado. The experiment will run through the end of September. 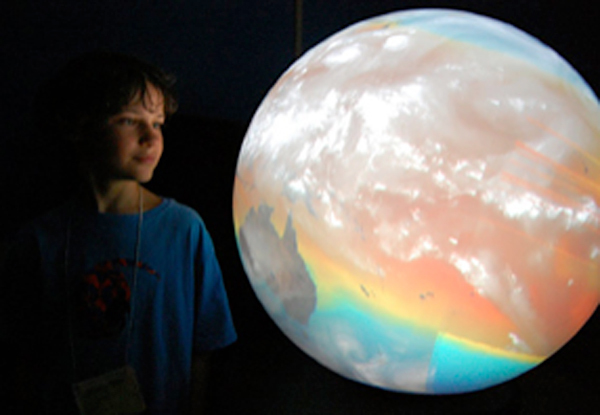 In July, the Center’s 3D Globe traveled to the Experimental Aircraft Association (EAA) Museum in Oshkosh for the 2010 AirVenture. The Globe was available for viewing by over 50,000 visitors the week of the annual “fly-in.” A new display showing pilot reports of turbulence was created just for EAA and the air show. The Globe will remain at EAA until early September. With support from the NOAA NESDIS Education Office, CIMSS organized a teacher workshop at the July meeting of the Earth Science Information Partners (ESIP) Federation in Knoxville, Tennessee. Over two dozen educators participated in the 3-day event. Teacher track sessions were conducted by ESIP members from NOAA, NASA, EPA, DOE, CIMSS, UNH and UCSB. Steve Ackerman and Margaret Mooney presented their NASA-funded Climate Literacy Ambassadors project by sharing activities and resources from an on-line course on Global and Regional Climate Change. After a short presentation, participants worked through two activities including a statistics exercise utilizing ice-on/ice-off data from Madison, Wisconsin. G6-12 science teachers were then invited to join a Global Climate Change Educator project as part of the Climate Literacy Ambassadors where they can take the on-line course in October and receive stipends and become ambassadors of climate literacy in their local schools and communities. The workshop was organized with support from NESDIS Education Office. About a third of the attendees were part of the new NOAA Climate Stewards Education Program, a national network that has been meeting via teleconference since January 2010. The ESIP teacher workshop marked the first face-to-face meeting of a subset from this pilot project. ESIP Teacher Workshop, July 2010. 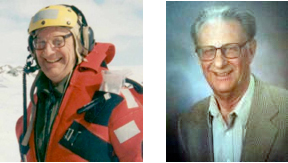 The Byrd Polar Research Center (BPRC) at Ohio State University awarded the Goldthwait Polar Research Medal for 2010 posthumously to Dr. Charles Stearns for his 30 years of research in Antarctica. Dr. Stearns initiated the Automatic Weather Station observation network in Antarctic as well as the composite satellite imagery that is now routinely provided by the Antarctic Meteorological Research Center. The award was presented by BPRC Director Ellen Mosley-Thompson following a celebration of Dr. Stearns contributions at the 5th Antarctic Meteorological Observation, Modeling, and Forecasting Workshop held on 12-14 July 2010 in Columbus, Ohio. His son, Jim, accepted the award on behalf of the family. CIMSS is generating routine Geostationary Operational Environmental Satellite (GOES)-15 Sounder products, including derived product imagery (DPI) of total precipitable water, Lifted Index (stability), and cloud-top pressure. The GOES-15 NOAA Science test will begin 11 August 2010. July 2010 marks the 4-year anniversary of the Cooperative Institute for Meteorological Satellite Studies (CIMSS) supplying Moderate Resolution Imaging Spectroradiometer (MODIS) images and products to National Weather Service (NWS) users in an Advanced Weather Interactive Processing System (AWIPS) format. To date, 51 NWS forecast offices have begun to use the CIMSS-supplied MODIS imagery in their local AWIPS workstations, with 22 of these offices actively mentioning MODIS in their daily Area Forecast Discussions. Examples of the MODIS images being supplied in an AWIPS format can be found on the CIMSS Satellite Blog. Scott Lindstrom led the Virtual Institute for Satellite Integration Training (VISIT) distance learning module “The University of Wisconsin Convective Initiation Product” on 27 July 2010. The National Weather Service forecast office at Chicago and the Spaceflight Meteorology Group at NASA’s Johnson Space Center participated in the VISIT lesson. Updates to the Cooperative Institute for Meteorological Satellite Studies (CIMSS) Satellite Blog included Geostationary Operational Environmental Satellite (GOES), Polar Operational Environmental Satellite (POES), and Moderate Resolution Imaging Spectroradiometer (MODIS) images of severe thunderstorms that were responsible for an aircraft encounter of severe turbulence that caused multiple injuries, extremely large hail that set a new US record for size and weight, and a large wind-driven hail damage swath in South Dakota. 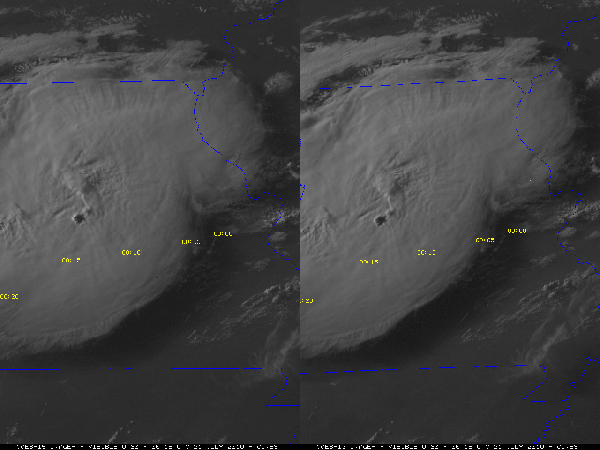 GOES-15 (left) and GOES-13 (right) visible channel images with overlays of the times of the position of United Airlines Flight 967 where it encountered severe turbulence as it flew in the vicinity of rapidly-developing thunderstorms over Missouri on the evening of 20 July 2010. A manuscript entitled “Impacts of transported background ozone on California air quality during the ARCTAS-CARB period – a multi-scale modeling study” by Huang, M., Carmichael, G. R., Adhikary, B., Spak, S. N., Kulkarni, S., Cheng, Y. F., Wei, C., Tang, Y., Parrish, D. D., Oltmans, S. J., D’Allura, A., Kaduwela, A., Cai, C., Weinheimer, A. J., Wong, M., Pierce, R. B., Al-Saadi, J. A., Streets, D. G., and Zhang, Q. was published in the journal Atmospheric Chemistry and Physics. The manuscript presents results from numerical experiments using the University of Iowa Sulfur Transport and dEposition Model (STEM) atmospheric chemistry model to analyze the effects of transported background ozone from the eastern Pacific on California air quality during June 2008 California Air Resources Board (CARB) phase of the NASA Arctic Research of the Composition of the Troposphere from Aircraft and Satellites ARCTAS field mission. The results show that the use of Real-time Air Quality Modeling System (RAQMS) lateral boundary conditions, which include assimilation of Microwave Limb Sounder (MLS) stratospheric ozone profiles and Ozone Monitoring Instrument (OMI) total column ozone data, improves the model performance, although biases can be introduced.